Hello Toothpaste Review: The Healthy Option You've Been Looking For? The best word to describe Hello Toothpaste is ‘thoughtful’. Hello Toothpaste ingredients are extremely effective at polishing, cleaning and whitening teeth as well as protecting both them and your gums. At the same time it is 100% vegan, ethical and sustainable. There’s a wide variety of products to choose from in the Hello toothpaste range. Their charcoal toothpastes and kids’ range are the most popular. This article will help you decide whether Hello Toothpaste is right for you and, if so, which one best suits your oral hygiene needs. What makes Hello toothpaste unique? The word thoughtful truly sums up the Hello Toothpaste range. Whatever aspect of your oral hygiene regime matters to you, Hello have it covered. Obviously, you want a toothpaste that cleans and whitens your teeth, as well as protecting both them and your gums. Hello does. What makes it different is that it does the job effectively without using any ingredients that are artificial or harmful for people or the planet. Worried about the possible risks of using fluoride? Hello provide a fluoride free range. Concerned about animal testing? Hello products – and all the ingredients in its supply chain – are never tested on animals. Vegan? So is Hello. Even the packaging and the ink used for printing on it are ethically and sustainably sourced. Its founder can be readily contacted on Skype and he’ll reassure you that if you have ethical values, Hello absolutely reflects these values whilst doing a great job of looking after your oral health. Hello provide a wide range of toothpastes and some have flavour variants. Furthermore, there are different purchasing options, eg 1.5oz, 4.2oz and multipacks. The multipacks represent best value for money. This list of options will give you an idea of the enormous range of choice available to you with the Hello range. Hello Oral Care Fluoride Toothpaste: Mojito Whitening (Mojito Mint), Extra Whitening (Pure Mint), Sensitivity Relief (Soothing Mint and Coconut). Hello Oral Care Fluoride Toothpaste for Kids 2 years+ Available in: Blue Raspberry, Bubble Gum. Kids’ Toothpastes, both the fluoride and fluoride free versions. These are the ones we will focus on in this article – but you can click the links above to find out about the others. Hello Activated Charcoal Toothpaste contains activated bamboo charcoal that naturally and gently cleans tooth enamel and whitens teeth by removing surface stains. Charcoal particles are porous and they absorb the tannins that are contained in common staining products like tea, coffee and red wines. Together with coconut oil, erythritol and xylitol, charcoal also absorbs and reduces toxins and harmful bacteria in the mouth, thereby protecting teeth and gums and keeping breath fresh. The coconut oil also works with aloe vera to soothe and moisturize. Hello Activated Charcoal Toothpaste does not contain fluoride. It’s made in the US and is as eco friendly as possible. It is very popular on Amazon, with users liking its taste, texture and whitening potential. Minty flavour that’s not overpowering. Dark paste takes getting used to and may stain your sink if not rinsed thoroughly. Contains 1 - 4oz tube of activated charcoal fluoride free whitening toothpaste. Sorbitol (Moisturizes), Hydrated Silica (Polishes and Cleans Teeth), Vegetable Glycerin (Soothes and Moisturizes), Xylitol (Sweetener), Purified Water, Charcoal Powder (Whitens, Polishes and Clean Teeth/Freshens Breath), Flavor (Freshens Breath), Xanthan Gum (Thickener), Titanium Dioxide (Mineral), Cocamidopropyl Betaine (Cleanser), Sodium Cocoyl Glutamate (Cleanser), Coconut Oil (Soothes and Moisturizes), Potassium Sorbate (Maintains Stability) and Stevia Rebaudiana Leaf Extract (Sweetener). -> Certified Organic and Vegan. -> Free from fluoride, SLS, peroxide, dyes and gluten. How abrasive is this toothpaste? It is far less abrasive than charcoal powder and within the International Organisation for Standard for enamel safety. Do you use this in place of your regular toothpaste or as well as? Either! It is fine to use every day, twice a day, either in addition to, or in place of, your normal toothpaste. Yes and the cartons are recyclable and the tubes are made from bpa-free plastic. Does it prevent tooth decay? Yes, it contains xylitol. This is a natural sweetener which does not promote decay and also helps bacteria from sticking to your teeth. The charcoal particles and coconut oil also help to reduce the bacteria load in your mouth. If bacteria multiply they produce acid and that is what causes decay. There are two fluoride free products for children. Both aim to prevent cavities through the use of xylitol. Sugary foods make acid producing bacteria multiply in the mouth. The acid attacks tooth enamel causing decay and cavities. Xylitol is a natural plant based sweetener that does not break down like sugar so it helps to control the bacteria load in your mouth. It also prevents bacteria from sticking to teeth. Watermelon flavour is best for kids aged 2+ who have learned to brush and spit. It is formulated to remove plaque as well as cleaning and whitening teeth. For babies and toddlers up to two years, Hello have an Organic Apple flavoured clear gel toothpaste that is safe to swallow. It will keep new teeth and baby gums clean whilst the flavour is designed to encourage youngsters to be enthusiastic about the brushing routine. This product is very popular on Amazon, with an unbelievably high number of reviews -> see details. Great taste – and the Organic Apple Flavour is safe to swallow. Does not contain Sodium Lauryl Sulphate. Cost – a little higher than big brands (see price). Does not contain fluoride – which can be considered a pro if you are concerned about possible effects of fluoride. Contains 4 - 4.2oz tubes of fluoride free toothpaste for children. Say hello to naturally friendly fluoride free and sls free natural watermelon toothpaste. It polishes and brightens, removes plaque and tastes awesome. No dyes or artificial sweeteners, no SLS. No brainer! Hello is thoughtfully formulated with high quality ingredients like xylitol, erythritol, soothing aloe vera, and a silica blend that gently polish teeth. We're serious about being friendly, and about what goes into little mouths. Free from dyes, sls/sulfates, artificial sweeteners/flavors, microbeads, triclosan and gluten. sorbitol (Moisturizer), hydrated silica (polishes and cleans teeth), purified water, vegetable glycerin (soothes and moisturizes), aloe vera gel (soothes and moisturizes), xylitol (sweetener), erythritol (sweetener), natural flavor (taste), xantham gum (thickener), lauryl glucoside (coconut/palm and corn derived cleanser), calcium glycerophosphate (mineral), titanium dioxide (mineral), potassium sorbate (maintains stability) and stevia rebaudiana leaf extract (sweetener). vegetable glycerin (soothes and moisturizes), sorbitol (moisturizer), purified water, aloe vera gel (soothes and moisturizes), hydrated silica (thickener), xylitol (sweetener), erythritol (sweetener), xanthan gum (thickener), flavor* (taste), calcium glycerophosphate (mineral), potassium sorbate (maintains stability) and stevia rebaudiana leaf extract (sweetener)*. Both toothpastes are free from SLS, artificial sweeteners and flavours, dyes, parabens, microbeads, triclosan, and gluten, are not tested on animals and are ethically and sustainably sourced. Does fluoride free toothpaste actually protect your teeth? Since small children are more likely to swallow the toothpaste many parents want to buy fluoride free toothpaste. 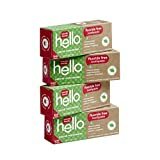 Hello uses Xylitol, a plant based sweetener that helps to control the bacteria load in your mouth and prevents bacteria from sticking to teeth. How much xylitol is in the Watermelon Paste? Is the Watermelon flavour a gel or a paste? It is a paste, organic apple is a gel. Hello Kids Toothpaste is an anti cavity toothpaste. The active ingredient, fluoride, is a natural mineral that combines with the enamel on growing teeth to help prevent tooth decay. After teeth are fully formed it works with saliva to protect tooth enamel from sugar and plaque. In addition to preventing cavities Hello Kids Toothpaste safely polishes and brightens young teeth. It contains no artificial flavours or sweeteners, no dyes, microbeads, triclosan, parabens or gluten and is cruelty free. It is available in Blue Raspberry and Bubble Gum flavours designed to appeal to kids and make them ‘rush to brush’. It is a much loved product on Amazon. Great taste – but hard enough to open to stop youngsters eating it! Contains fluoride – though this can be viewed as a con if you are concerned about possible effects of fluoride. Contains Sodium Lauryl Sulphate. This is a cleansing and foaming agent generally considered to be safe but can cause irritation in rare cases. Say hello to naturally friendly blue raspberry fluoride toothpaste. Prevents cavities, strengthens enamel, polishes and brightens. Tastes awesome. No dyes or artificial sweeteners, no preservatives. No brainer! sorbitol (moisturizer), hydrated silica (polishes and cleans teeth), glycerin (soothes and moisturizes), purified water, xylitol (sweetener), flavor (yum), xanthan gum (thickener), sodium lauryl sulfate (cleanser), titanium dioxide (appearance) and stevia rebaudiana leaf extract (sweetener). Is the Bubble Gum flavour a pink toothpaste? No, it is a white paste. Why does the fluoride version contain Sodium Lauryl Sulphate? Toothpaste usually contains SLS to create a foam and enhance the cleaning capabilities of the product. However, it can cause irritation in some cases. Hello are working on getting rid of SLS and this should happen soon. Is this product suitable for an 18 month child that is not spitting out toothpaste? Hello do a fluoride free product (see below) that is safe to swallow and is more appropriate for very young children or those not spitting out their toothpaste yet. So what’s the verdict on Hello Toothpastes? Hello are a company that believe in operating in a way that is friendly towards both humans, animals (their chief greeting officer is a dog!) and the planet. That’s why they called themselves ‘hello’ – the friendliest word around. They think small things matter and that every action we take, including brushing our teeth, should be thoughtful but fun. At the same time they want to provide a product that does what a toothpaste should – clean and brighten teeth, protect teeth and gums and freshen breath. Hello aims to combine the need for effective oral care with an eco-friendly, ethical and sustainable approach to sourcing ingredients. Its users generally love the product and it scores highly on Amazon. Any questions you have about it can be readily answered by Skyping the founder of Hello, Craig Dubitsky. One blot on the Hello landscape is the use of SLS in their kids’ fluoride toothpastes. However, in response to customer feedback about this, Hello is working to put this right. 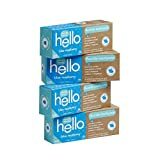 On the whole, if you are someone with ethical values who wants to do the right thing in all contexts, including your oral hygiene routine, Hello is a brand you should consider.